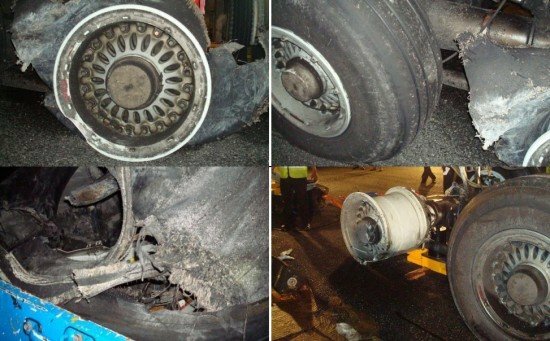 The UAE General Civil Aviation Authority (GCAA) released an incident investigation report regarding a tyre burst incident involving a Boeing 777 landing on a wet runway in Male, Maldives. The Emirates flight departed from Colombo, Sri Lanka on December 2, 2011 on a scheduled service destined for Malé International Airport, Maldives. A total of 17 crew and 232 passengers were onboard the Boeing 777-300 (A6-EMR). No abnormalities were reported by the crew during the flight and as the aircraft approached Male and passing through 6000 feet, ATC information on the weather conditions was communicated to the crew. At this time, the runway was wet with tailwinds of up to 8 knots. The crew recalculated the landing performance with auto-brake selection 4 (ABS4). The calculation indicated that the performance would be acceptable and the crew decided to continue the approach. The wind was monitored during the approach, checked with ATC and just prior to touchdown the wind given approximately from 210° at 5 knts. The landing was made in the touchdown zone and was described by both crew members, as ‘normal’. Full reverse was selected but the crew stated that the braking action which occurred was not as expected for an ABS4 setting. Aside from the intensity of the braking being less than expected, the crew stated that the initial roll-out was otherwise normal. Approximately halfway along the runway, at around 90 knts, the Pilot Monitoring (First Officer) called ‘EICAS autobrake’ and the Flying Pilot (Captain) initiated manual braking. Approximately 2 seconds after this, the First Officer called ‘EICAS antiskid’ with an EICAS ‘Auto speed brake’ message. The Captain manually decelerated to a slow taxi speed for the required 180° turn on the runway. Halfway through the turn, the aircraft was felt to be skidding slightly. After the turn, the crew observed tire debris on the runway and, as the aircraft did not feel normal, a complete stop was made. Another crew confirmed that there was debris at the beginning of runway 36. The Tower controller was informed at which time the ground maintenance crew was approaching the B777. The ground engineer informed the crew that the Left Hand Main Landing Gear tires 1 and 2 had separated from the wheel hubs and that there was other damage to the MLG. It appeared that the junction boxes of both main landing gears had detached. Loss or significant damage to these junction boxes can lead to loss or degradation in braking including anti-skid control. The loss of anti-skid control can lead to tire skidding and associated frictional heating. Male Airport Runway Condition leading to areas of standing water. Information provided by ATC to the Crew concerning the status of the runway. Lack of reduction of the areas of standing water on the runway to below a depth that posed a hazard to the aircraft. The ability of the junction box securing straps to withstand the loads from the water encountered during the landing sequence.